We should expect rain showers throughout the rest of the day with a potential of thunderstorms later this afternoon and evening. This latest spell of wet weather is predicted to break late tonight or early tomorrow morning bringing dry weather through early Friday morning when more rain is predicted to start up and last throughout the weekend. The temperatures are expected to drop significantly this week as the freezing level dips down to about 1,500 feet (yes, that’s one thousand five hundred feet above sea level). Winds tonight will be gusty, blowing as high as 30mph. Tides: Tide peak highs are predicted slightly below 6-ft this week, but there is currently a residual of 1.25-ft higher than predicted. If this persists, we’ll be seeing peak tides over 7-ft, which could result in tidally-influence flooding at low-lying areas near the bay. Note that these predictions are for the Golden Gate Bridge tide gage. 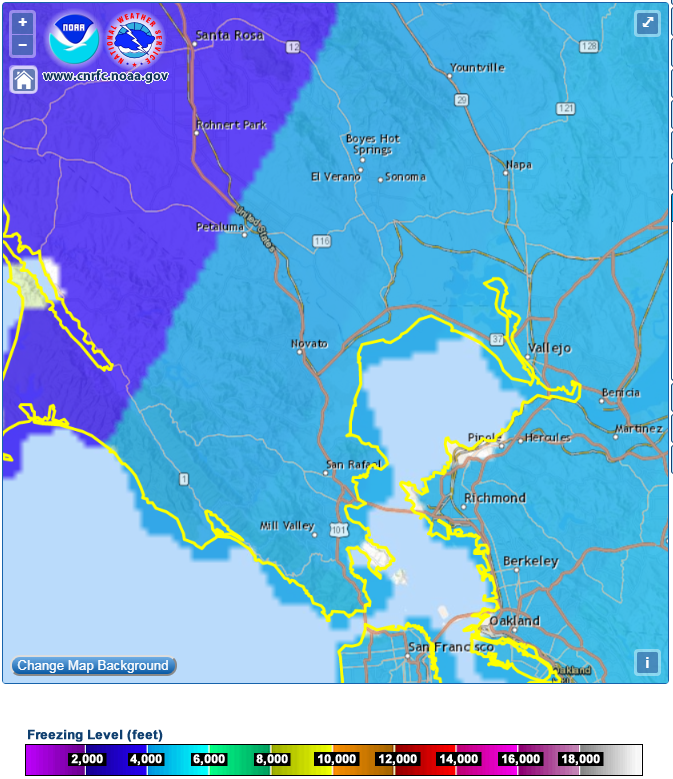 At specific locations throughout the north bay, peak times will be later, and heights may vary, but typically not by much. It’s going to be a chilly week. If precipitation and cold air are perfectly timed we may even see snow along Hwy 101 corridor, it’s unlikely that it will stick, but we may still see it. Please leave additional travel time to allow for extra cautious driving. –To receive community alerts and advisories from local agencies, sign up for Nixle alerts online or text your zip code to 888-777. –To receive emergency notifications, sign up for AlertMarin.